I spent last night in conversation with my mom regarding the current state of affairs and the political fallout from the actions of a mad man that shall not be named. * I find the shirt fitting because I’m not going to run, I am not going to cower, I am going to stand and fight against the coming onslaught. I am going to fight against those who would disarm the law abiding, I will fight those who think that one more law would magically stop a mad man, I will fight against those who think that the appearance of a weapon is some how related to its effectiveness, I am going to fight against those who use the tragedy and misfortune of innocent children and families to further their own political agenda. Ultimately I am fighting against those who would disarm the victims to ensure they are incapable of mounting the most effective response and defense. Ultimately in the words of Malcolm Renyolds, “I aim to misbehave.” Because my stepping up to the plate is exactly what our opponents would say is misbehavior. They would rather I just shut up and sit in the corner so they could then use my silence as an indication that I feel guilty for the actions of another. No. 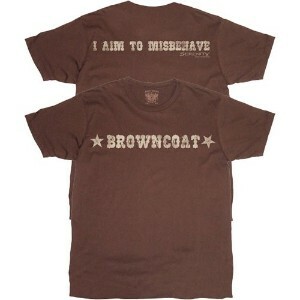 I aim to misbehave. I aim to act and pursue this in ways they couldn’t imagine. I aim to help the big dogs in this fight to take control of the conversation and pummel our opponents into the ground. I aim to make this their last stand. I aim to put them into the dust bin of history next to the KKK. Me thinks I’m going to have to watch Serenity when I get home tonight. *Seriously, if you put his name in the comments I will perma-ban you, I will not aid in giving these people fame for their atrocities. Tagged Browncoat, Firearms. Bookmark the permalink. Shall we dub it “Wawa Twinkleshines” instead of its real name?